O2 Blueroom is designed by Jump Studios and located at Oxford Street London, this luxurious lounge bar has a futuristic interior design. 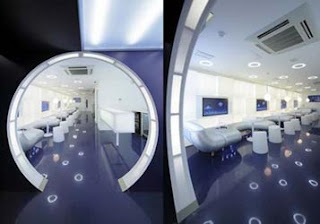 The Futuristic Blueroom is located on the lower ground floor of O2 shops. In the Blueroom customer are able to relax while downloading media content such as MP3 files and latest video clips. This lounge also has internet access and great ambience. The curve shape on the furniture, lighting and interior element added a futuristic touch to this lounge. 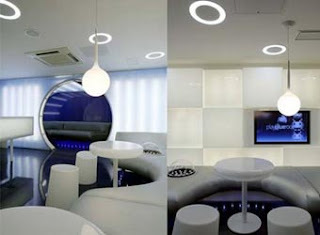 O2 Blue room lighting is a major elements that create the luxurious and futuristic looks. The reflective floor, wall lighting and floor lighting add more dramatic value to the interior design. Ooh, I love this. I need some doors like this in my house! I'm going soon I'm on O2, get in for free love it!! !